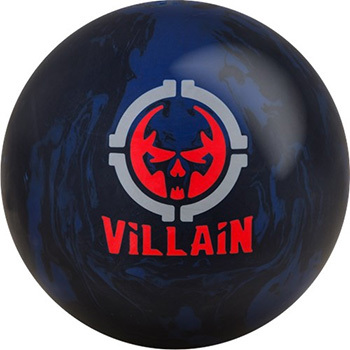 Something Sinister has returned to the MOTIV product line and is at the core of the new Villain. Created to bring devastation on higher volume patterns, the Villain features an incredibly versatile Coercion MFS solid cover and the high RG asymmetric Sinister core. In the shadows for years, the Sinister core has finally returned to give the powerful Villain easier length than any other asymmetric core in the MOTIV line. Combining a high RG with loads of differential, the Sinister core enables the Villain to display impressive power and continuation down lane. Cloaked in a new Coercion MFS Reactive cover, the solid black and blue Villain is powerful yet offers great versatility on medium-heavy lane conditions. The 3000 Grit LSS finish provides a stable footprint while also allowing the Villain to retain enough energy to display outstanding continuation. The Villain offers incredible performance, versatility, and value. It is the first asymmetric MOTIV ball ever offered below the premium price point and its versatile performance fits a wide variety of bowlers. Adding to its versatility, the Villain responds very well to surface adjustments. Take the finish down for a smoother motion on heavy oil or take it up to a higher grit for a moderate benchmark motion.